For certified yoga teachers, a 40-to-60 hour yoga teacher training refresher can bring you back to the basics and enhance new ideas, while immersing you in yoga as a student once again. While not all of these are billed as 40-to-60 hour yoga teacher training refresher courses, they are described by the organizers as suitable for short refresher courses, even if the actual name of the program is a yoga vacation or a yoga retreat. While many retreats and vacations are organized for people looking to escape their hectic lives for a period of time, yoga retreats also exist for certified teachers. In addition, formal teacher refresher courses provide structured content suitable to be placed on any certified teacher's resume. The refresher course offered by Sivananda Yoga Vedanta Centers is a comprehensive advanced training that not only delivers additional skills and focal points, but also gives yoga teachers the opportunity to come together to discuss all aspects of yoga. The two-week program is as intense as a residential 30-day yoga teachers' training program, but there are no exams and no writing assignments. This allows for a more relaxed atmosphere and a communal experience. Attendance at all daily sessions is required, and like an intensive teachers' training, getting up before dawn is the norm. Sivananda Centers provide dormitory accommodations.Offered at several ashrams around India, the yoga teachers' refresher course is open only to graduates of a Sivananda teachers' training course. The Aura Wellness Center offers several different correspondence courses, including general yoga teachers' training packages, as well as specialized certifications, such as prenatal yoga certification for teachers who already hold a general certification. While many yogis question the value of correspondence courses for yoga teacher training, it is also true, especially in the realm of refresher courses and specialization courses, that correspondence courses can be sufficient, depending on the student. If you are looking for an affordable option that also enables you to stay at home with your family instead of traveling to a course, Aura courses may be something to consider. 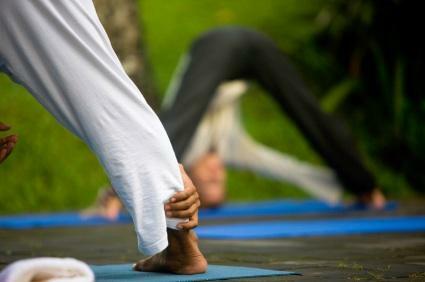 Offering regular teachers' training courses, Seeds of Yoga also hosts retreats that focus on yoga teachers. Several retreats are one week long, and are offered in inspiring locations for yogis, such as in Turkey, India, and around Europe. A yoga retreat with several practicing yoga teachers can help teachers refine and refresh their skills both in yoga and in teaching. In addition, the retreat is a one-of-a-kind yoga experience that will inspire you, as well as enhance your resume. While the fee is reasonable (800 Euros), don't forget to budget in the considerable travel costs. With short immersion programs all over the globe, Jivamukti offers a condensed yoga teacher immersion for teachers looking for a refresher course or an expansion on what they already know. While these immersion programs are recommended for yoga teachers seeking a refresher course, beginners are also admitted, so expect a wide range of yoga abilities and knowledge bases. If you have the discipline to focus on your own level, one of these immersion programs can serve as a great refresher, not to mention be a wonderful yoga experience. Another way to keep up-to-date on yoga is to frequently attend workshops in your area. While all of the above options require a certain time commitment and travel expenses, attending one weekend workshop a month locally is also a great way to stay abreast of yoga developments and maintain a network with yogis in your region. As a yoga teacher, you are always the source of knowledge in your studio. Attending a refresher course is an uplifting experience because you are free to become a student again, stretching your limits and discovering aspects of your own yoga practice that might be overlooked while teaching. A yoga refresher course is also an excellent opportunity to meet other yoga teachers and discuss with them their goals, successes, and difficulties in teaching yoga. This sort of support network can prove absolutely indispensable in the future.